I have regularly searched the Web since, but never found anything. Then, as readers of the blog will know, in March the truly amazing Katy George in Kent found a letter of Kittie’s amongst some items in a charity shop (see Katy’s Comment of 15 March and my post of 23 March). As if that were not enough, at the end of May Katy spotted a copy of George’s 1904 Dwala for sale through Abebooks, inscribed by Kittie and with a letter from her preserved inside it! It arrived from Tasmania only six days later. The book itself is very rare, and turned out to be a gift from Kittie to Frederick O’Brien, an American writer on the South Seas who had sent her two copies of his long, laudatory article on George’s Tahiti in the New York Times Book Review of 5 March 1922. She wrote to thank him for this. 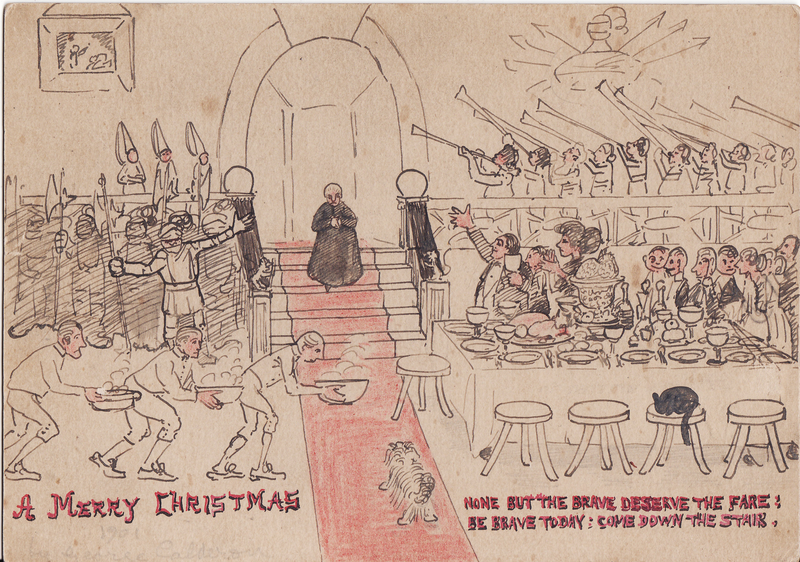 It is inscribed by Kittie on the back in pencil: A Christmas card drawn by G.C. to try and persuade my mother to come down to Christmas dinner — our first Christmas at Heathland Lodge 1901 Hampstead. BE BRAVE TODAY: COME DOWN THE STAIR. This cartoon strikes me as one of the funniest George ever drew. Lest anyone think, in the aggrieved manner of 2015, that it is meant to be unkind or satirical, let me assure them at once that it is not. It is genuinely intended as an act of caring and humorous persuasion. 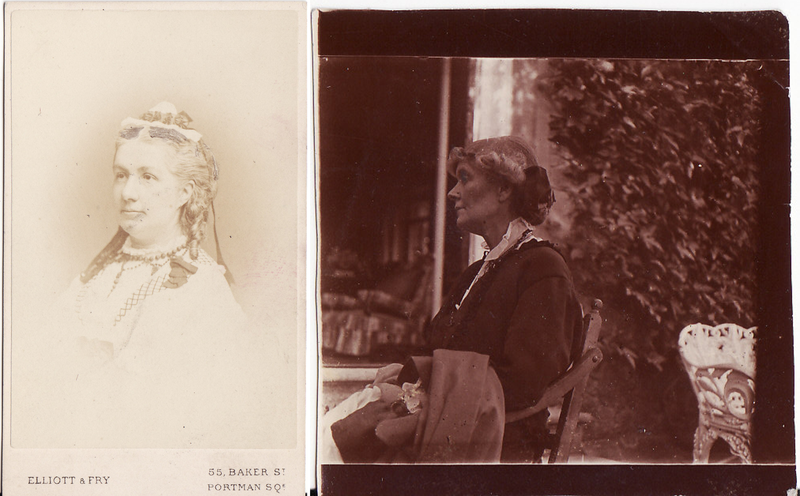 Mrs Hamilton (1825-1906) got on extremely well with George, once her daughter was married to him and he had a job. He was the favoured person for lifting her in bed and making her laugh. Her health was very bad for the last five years of her life, and unfortunately she died whilst George was on his way back from Tahiti. My guess is that this cartoon did persuade Mrs Hamilton to come downstairs for Kittie and George’s first Christmas dinner in their new home — and I’ll never complain about the Internet again! This entry was posted in George Calderon, Personal Commentary, Timeline and tagged cartoons, Christmas 1901, Christmas cards, Clara Calderon, George Calderon, Heathland Lodge, Jones, Katy George, Kittie Calderon, manuscripts, Mary Hamilton, Percy Lubbock. Bookmark the permalink.